For that to make any sense, I have to make a small confession. When we first picked Canberra from the list of state-sponsored visa options (we could have selected South Australia or Western Australia too), we felt it was the right choice for us… we hoped it was the right choice for us… but it was impossible to know for sure. Our outward narrative was as much about selling our choice to ourselves as it was about selling it to our friends and family, and of course the ACT government, who had to be convinced of our desire and commitment for a new life here. I’m not saying that we lied, just that it was impossible to know for sure. And, like any new migrant, we occasionally talked about a plan B or C.
Six months ago, as new arrivals with our only Australian friends living far away in other states, we agreed those contingency plans, once our compulsory two years in Canberra were complete, would be Melbourne if we wanted a more urgent, vibrant city on our doorstep, or perhaps Tasmania if we wanted a more affordable lifestyle with ready access to spectacular nature. But over the weekend, something crept up on us. A realisation that we didn’t want more hustle and bustle, that there is spectacular nature on our doorstep here too, and that everything else is within easy reach for weekends and holidays. Something more important happened too. We found ourselves beginning to feel integrated into life here. A kids’ social event here, an impromptu dinner with friends there, and a “call in if you’re passing” to a family we have met through the kids’ school. It all prompted one of those Sunday evenings where we didn’t put the TV on, didn’t fire up the laptop for a spot of work, and didn’t even open a bottle of wine to toast the end of the weekend. Instead we just had one of those: “I think we did the right thing” conversations and, before we knew it, we were talking not about whether we would stay in Canberra in 18 months time, but about what type of house we should be looking for when our rental period ends, in which neighbourhood, and what kind of central heating we’d like. Oh, and we started planning a holiday in Tasmania for good measure. The sub-text to all of that needed no airing. The outward narrative now matches the internal one. Of course, life can always throw the unexpected at you but our six month anniversary here also marked a transition for us, from settling in, to planning for the long term. In the end, much as we started out selling the idea of Canberra to ourselves and relatives, Canberra just got on with quietly selling itself by being a great place to live. 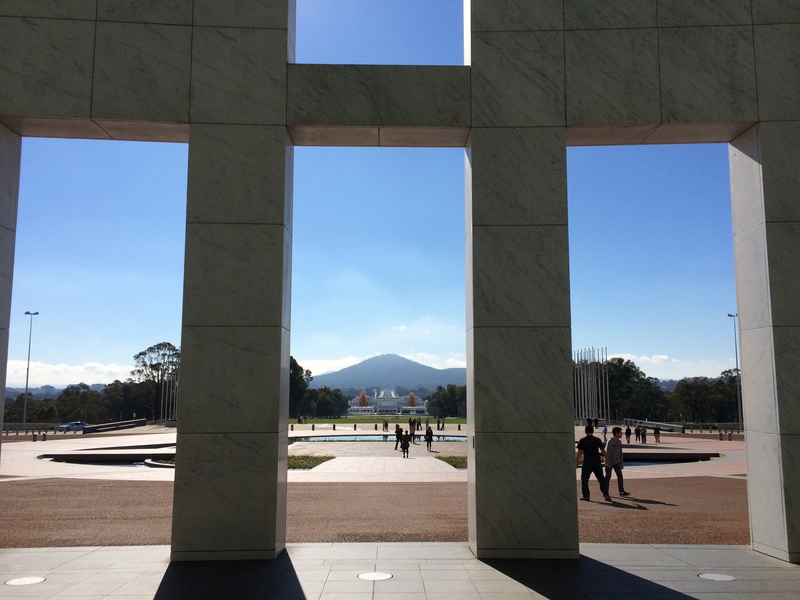 It’s been six months since we arrived in Canberra and, in that time, I’ve been blogging more or less twice a week. Inevitably, as we settle into life here, there will be fewer ‘new’ things to post about. At the same time, I have a couple of writing projects — a novel and a contribution to a non-fiction business book — to deliver in the second half of 2015, so I’m going to make more room for those projects by posting less frequently here. I’m not disappearing completely, and I have several posts up my sleeve about Nanny CBRbound’s recent visit to Australia. If you are interested in hearing about my book projects, I’m going to set up a separate blog and Twitter account, which I’ll share details of soon, but for now, thanks for following here and I look forward to continuing to share our experiences of life in Canberra, albeit less frequently than twice a week. This is a lovely post Mark … and so glad that Canberra has crept up on you. It does that I think. I chose to come here because I thought I liked it, from a couple of very brief visits. Of course there were lonely times (I came here single) and of course I went “home” often (I could as it was Sydney) but I can’t ever regretting making the move. Canberra was much quieter then, but it was still beautiful, it did have a social life, and I could get there where I wanted to in the evening, park safely, and enjoy myself. I do hope you do keep us up to date even if it’s less than twice a week. Enjoy life. Thanks Sue. I recognise much of that. It’s not an easy thing to do, but there are signposts along the way, marking the journey, and soon, it does begin to feel better, and then right, and then like home. I’ll keep posting, don’t worry, I just need to divert some time and attention to some more immersive projects, but I’ll still come up for air (and continue exploring Canberra). Thanks for following and encouraging our journey these past months. Yes, I understand about having to change your focus. Good luck, and I’ll watch out for your new blog.